It is important to ensure your community not only has enough drinking water, but that it is also conserving precious resources like water, energy and municipal funds. So what can you do to be a steward in your community? There are a number of practices communities can implement to balance supply with demand and avoid water waste. Measuring community water use and collecting data on a regular basis is critical to making informed decisions about managing your utility, infrastructure and general drinking water service. The State of Illinois requires water suppliers to report annual water withdrawals and water use information. The Illinois State Water Survey (ISWS) is the agency responsible for managing the Illinois Water Inventory Program. The purpose of this program is to compile and maintain records on these withdrawals and usage data in order to glean an accurate understanding of water demand. Reporting to ISWS on water withdrawals and water use is mandatory for public water suppliers, industries that withdraw and use water as well as irrigation water users. This data is useful for you and for your water supply system operations to gauge per-capita water consumption and determine how much water is needed to supply your community. This is the first step in ensuring your utility can meet the needs of its customers. The amount of water Illinois can withdraw from Lake Michigan every year is limited by a U.S. Supreme Court decree. Any use of water from Lake Michigan within the State of Illinois is authorized by, and requires a permit from, the Illinois Department of Natural Resources (IDNR). Drinking water utilities are required to submit an annual water audit form called LMO-2 to IDNR and must also submit a monthly form which shows daily water usage numbers and the amount of water sold to other permitted drinking water utilities. These practices are important for every water utility that uses Lake Michigan as its drinking water source to ensure Illinois is complying with federal regulations. Wasting water wastes money, which is why controlling water loss in your drinking water distribution system is important. Water loss reduces your utility’s revenues, distorts data on customer usage, inflates production costs and stresses resources. Annual water loss audits are an invaluable practice in controlling water waste and reducing lost revenue. In basic terms: Knowing the amount of water produced and sent out into your distribution system, minus the amount of water used by your customers (known through metering), equals the amount of water not billed for. This water was somehow used or leaked within the distribution system—non-revenue water. The American Water Works Association (AWWA) has established a standard method as well as free software for utilities to use in conducting robust, annual water loss audits. Conducting annual water loss audits, validating the findings, implementing plans to ensure accurate meter readings and locating and repairing leaks are important to maintaining a viable, responsible and healthy water system. To keep track of infrastructure conditions and ensure your community is not paying for wasted water due to a leaky system, make sure your utility is using the latest practices and free resources to conduct annual water loss audits and reduce your system’s non-revenue water waste today. The City of Evanston invested in leak-detection equipment to proactively address water loss in its distribution system. Between 2013–2015 the City surveyed 314 miles of pipe and located five main breaks and eight service leaks. The savings from eliminating these leaks was estimated at 143 million gallons of water per year. 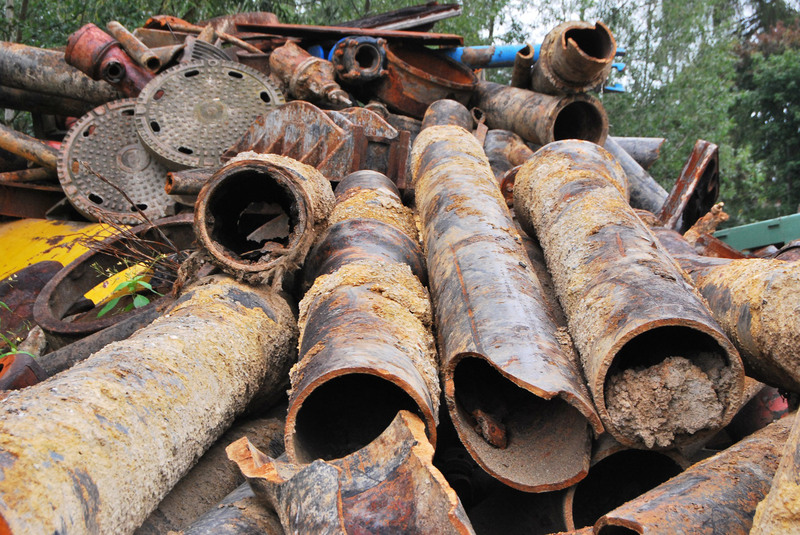 All of these leaks were found to be discharging directly into sewer laterals or mains, or into the ground. Without a leak-detection program, these leaks may never have been found. Additional benefits of reducing non-revenue water for the City of Evanston include cost savings from more accurate leak locating, avoidance of emergency repairs, the ability of city staff to survey all 160 miles of water mains annually without any increase to operating costs and a proactive approach to coming into compliance with the Illinois Department of Natural Resources (IDNR) rules on allowable water loss for communities that use Lake Michigan water. Knowing how much water your community uses, and understanding where improvements in your system should be made to reduce water waste, are both important steps. It is also necessary to analyze and understand how much water is available for future demand. While communities in Northeastern Illinois that have permits to use Lake Michigan water already have a set amount of supply, it is still important to analyze future demand to ensure your water allotment is sufficient for future population projections. If your community’s water source is not Lake Michigan, understanding how much groundwater or river water is available for your usage (and for the use of communities that share the same source) is imperative to ensuring ample supply now and into the future. As a leader, making sure your utility is conducting regular analysis on the supply and demand for drinking water in your community is important. Bringing new or alternative water sources online takes many years to design, permit and build. Don’t wait until it is too late to safeguard the community you serve. Understanding demands of water will help ensure thoughtful planning for future availability. 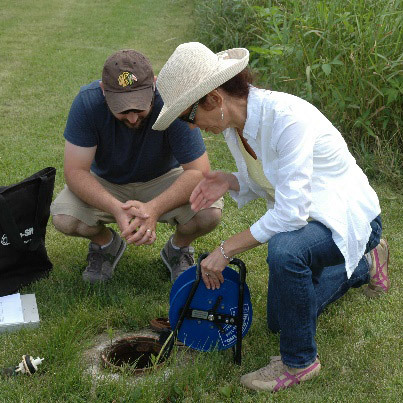 The Barrington Area Council of Governments (BACOG) operates a groundwater monitoring program that measures, maps and analyzes water levels and conditions in the region’s shallow aquifer system on a long-term basis. With regular data collection and analysis every five years, the program identifies trends in groundwater levels and describes where and how much water levels are changing. To achieve ongoing monitoring, BACOG collaborates with the Illinois State Geological Survey (ISGS), U.S. Geological Survey (USGS), the Flint Creek Watershed Partnership and 13 municipalities to obtain data from their respective wells and gauges on an ongoing basis. The BACOG office also relies on both the Illinois State Water Survey (ISWS) and ISGS for guidance and technical support. While dire conditions are not predicted, water levels in the BACOG area are expected to decline over the next few decades. This monitoring program will determine changes and produce data and reports to inform local government officials, providing the rationale and facts to enable action. The monitoring program and other groundwater efforts at BACOG are also expected to generate community awareness and support for groundwater protection. This proactive initiative for a small region of highly cooperative governments recognizes the critical value of data for addressing any future water supply challenges. The Illinois State Water Survey has been monitoring and modeling Illinois’ water resources for more than a century. Its current projections for certain groundwater supplies in Northeastern Illinois is quite worrisome, stating that some high-capacity wells could be unusable in as little as 15 years. The primary reason for groundwater aquifer depletion is unsustainable withdrawal by communities, private well users and agriculture. Depending on the type of aquifer your community uses for drinking water, you may be able to identify and designate groundwater recharge areas. These are land areas where rainfall is able to seep into the ground and help refill the aquifer. The Illinois State Water Survey or the U.S. Geological Survey are two agencies that can help communities identify groundwater recharge areas. If a particularly useful recharge area is identified, your municipality should take steps via a policy or ordinance to protect that area—for example, by not paving over it or approving uses that pollute the land—in order for clean rainwater to infiltrate those aquifers for future drinking water use. The least expensive guarantee of future drinking water is conservation and efficiency today. Managing demand helps ensure enough drinking water for your community. Following are strategies that help preserve precious water supplies for the future. Rainwater is a great source of water for outdoor irrigation and other purposes. Rainwater catchment systems, which can include cisterns and rain barrels, can be designed and installed on both small- and large-scales. On average, outdoor water use accounts for more than 30 percent of total household water use—that is a lot of drinking water! By promoting the capture and use of rainwater for outdoor irrigation, your community can reduce unnecessary demand on drinking water supplies. Reusing rainwater has the added benefit of reducing the amount of water entering your sewer system, which can help prevent sewer overflows and urban flooding in your region. Include information about cisterns and rain barrels in your community outreach and education programs, and collaborate with local organizations—such as the Metropolitan Water Reclamation District of Greater Chicago or the Conservation Foundation—to help homeowners purchase and use rain barrels. Consider how the municipality can reduce demand on drinking water for irrigation, perhaps by installing cisterns at public buildings and locations. Or you might install underground cisterns at schools or parks to provide flood relief and water for irrigating turf and other plants in the summer. Implementing water-conservation programs not only preserves water, but helps your community members save money. The Environmental Protection Agency’s WaterSense program provides tools and products for municipalities, businesses and consumers so they can be smarter about water use and saving money. 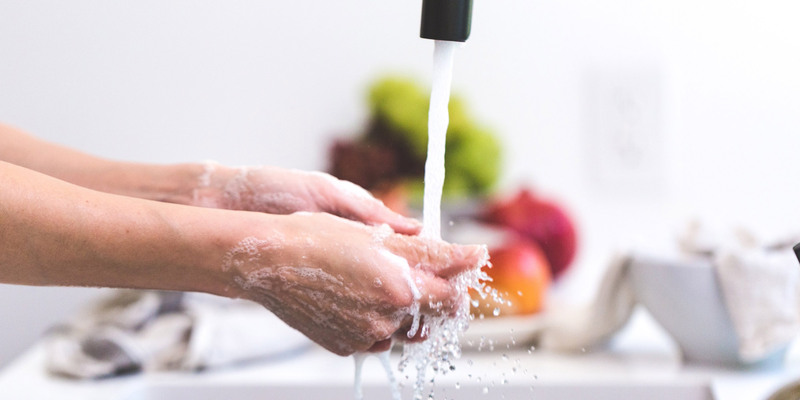 One component of the EPA’s WaterSense program is the certification of WaterSense-labeled products, such as showerheads, toilets and bathroom faucets. These products use at least 20 percent less water than conventionals. By implementing WaterSense products in all municipal buildings, you can save water and money, and set an example to residents in your community. The Alliance for Water Efficiency (AWE) is a national stakeholder-based nonprofit organization dedicated to the efficient and sustainable use of water. Headquartered in Chicago, AWE advocates for water-efficient products and programs, and provides information and assistance on water conservation efforts. AWE offers resources including a Water Conservation Tracking Tool. This tool uses your community’s usage data and system costs to evaluate the potential water savings, expenses and benefits of various conservation programs for your water system. In addition to the steps outlined above, there are useful guides and handbooks that outline the basics and best practices for tracking water usage, conducting water-loss audits, analyzing available supply and utilizing demand management to help ensure your community has sustainable water service. References and links to these helpful resources can be found in the resource section of this guide. The Village of Northbrook, Illinois recently constructed a new storm sewer and stormwater chamber underneath the northern half of the Village’s Wescott Park, a project undertaken in cooperation with the Metropolitan Water Reclamation District of Greater Chicago (MWRD), Northbrook Park District and Northbrook/Glenview School District 30. 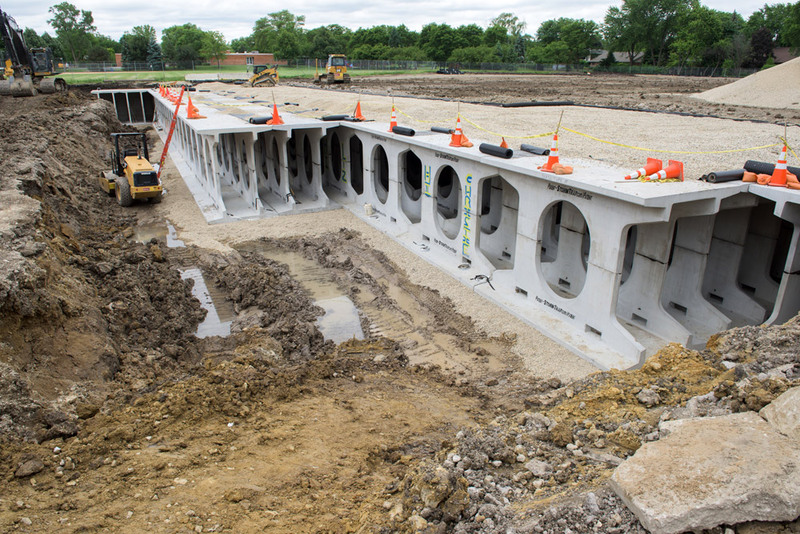 This 7.5-million-gallon chamber includes a rainwater harvesting system, which enables the Village and the Park District to reuse water captured during rainstorms, thus reducing the amount of drinking water used for irrigation purposes—a win-win. How are we keeping track of water usage? How are we recording that data on a regular basis for our community in order to ensure ample supply? Are we keeping up with the requirement to annually submit our water withdrawals and usage information to the Illinois State Water Survey? If your water comes from Lake Michigan: Are we submitting our LMO-2 Forms on time every year? Do we conduct annual water loss audits? Are we using the approved methodology and free software from the American Water Works Association (AWWA) to conduct those audits? What steps are we taking after an audit to validate the findings? How are results from the audit being considered within our water utility budget in order to fix and repair leaks, or invest in updated metering technology? Are we coordinating with our neighboring water supply utilities that use the same water sources we do? How? What kinds of demand-management programs is our community engaged in? Do we have a program that supports rainwater reuse in our community? Where can we implement rainwater reuse on our municipal properties to reduce demand for drinking water for outdoor irrigation purposes? Are we a member of the EPA WaterSense Program? Are we a member of the Alliance for Water Efficiency (AWE)? How can we utilize the tools provided by AWE to reduce drinking water demand? United States Environmental Protection Agency. WaterSense Statistics and Facts. Washington DC. 2017.